Brooks & Dunn debut at No. One this week on Billboard’s Top Country Albums chart with their collaboration project REBOOT. Brooks & Dunn share “Ain’t Nothing ‘Bout You” with Brett Young off of their upcoming collaboration project REBOOT, out April 5th. The Academy of Country Music announced today that Brooks & Dunn have been added to the lineup of performers for the 54th ACADEMY OF COUNTRY MUSIC AWARDS™. Kix Brooks has been added to the fifth annual “The First And The Worst” musical event taking place at Nashville’s City Winery on March 26th. Tune in to CMT Hot 20 this weekend to see Kix Brooks discuss the preservation of The Princess Theatre in Winnsboro, LA. Brooks & Dunn continue to preview their upcoming collaboration project REBOOT, out April 5th, with the release of “Mama Don’t Get Dressed Up For Nothing” with LANCO. Listen to the new song plus previously released tracks “Brand New Man” with Luke Combs, “My Next Broken Heart” with Jon Pardi and “Believe” with Kane Brown. The exhibit on award-winning duo Brooks &amp; Dunn opens August 9th. Initially united by their love of songwriting, Brooks and Dunn rocketed to stardom in the 1990s with their first four singles hitting #1. The museum’s exhibition will recall their early careers as solo artists and songwriters, the circumstances that united them as performers, and their innovative approach to stage production and touring. The track listing plus a new song was released today from Brooks & Dunn’s upcoming collaboration album REBOOT. 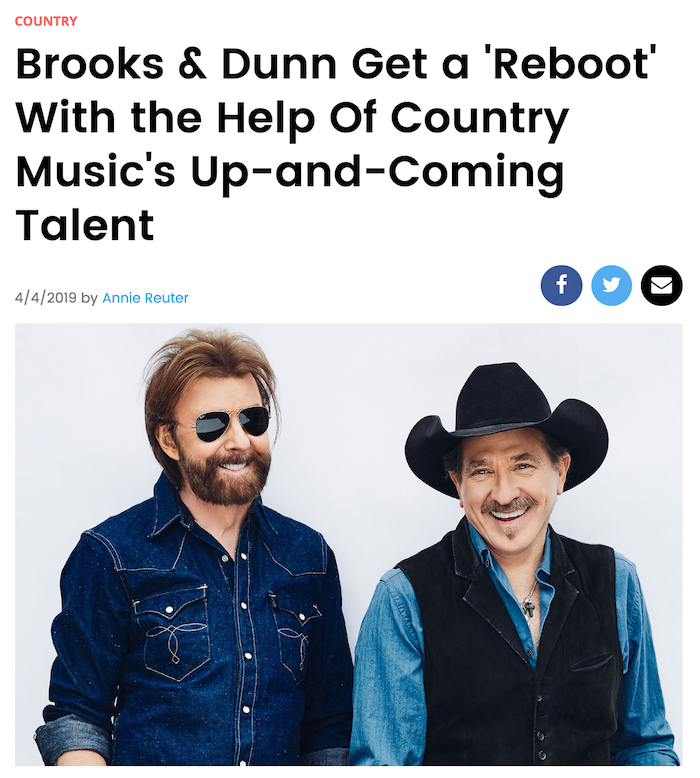 Brooks & Dunn announced today that their forthcoming collaboration album, REBOOT, will be available April 5th. Listen to the first two tracks released from the project, “Brand New Man” with Luke Combs and “Believe” with Kane Brown, now. Tune in to catch Kix Brooks on Trisha’s Southern Kitchen, Saturday, Jan 12th at 12PM | 11AM Central on Food Network. Trisha brings some friends to picnic at Arrington Vineyards with Kix. Like decorating the tree and putting cookies out for Santa, some holiday traditions are like gifts that keep on giving, such as Westwood One’s “An American Country Christmas with Kix Brooks,” now celebrating is 12th year of holiday cheer. “An American Country Christmas with Kix Brooks” features 24 hours of unique content featuring Christmas classics and an array of top country stars sharing their favorite holiday memories and traditions, including Jason Aldean, Blake Shelton, Keith Urban, Carrie Underwood, Lady Antebellum, Florida Georgia Line, Kenny Chesney, Brett Eldredge, Miranda Lambert, and many more. Westwood One’s holiday music specials are an honored tradition with hundreds of programmers, millions of listeners, and local advertisers. Listen for Westwood One’s “An American Country Christmas with Kix Brooks” any time from Saturday, December 22 through Tuesday, December 25, 2018, on a radio station near you. We are excited to announce additional 2019 dates for REBA, BROOKS & DUNN: Together in Vegas at The Colosseum at Caesars Palace! Tune in Saturday, November 10th through Monday, November 12th between 6AM and 12AM (local time) to hear Kix host Westwood One’s two hour special “A Salute to our Military Veterans.” Airing on a local radio station near you. Kix Brooks hosted a sold-out, two-day fundraiser Sept. 28-29 that raised $140,000 to secure the future survival and cultural mission of the Princess Theatre in Winnsboro, LA. More than 5,000 people gathered for the Arrington Vineyards Harvest Party on Saturday, Aug. 11, to benefit Monroe Carell Jr. Children’s Hospital at Vanderbilt. Kix is nominated for CMA Broadcast Personality of the Year at the 2018 CMA Awards for his American County Countdown program on Westwood One.